Few butterflies rival the size and beauty of swallowtails, and the Pipevine Swallowtail (Battus philenor) is no exception. Common to much of the southern USA, it really stands out in the Arizona low deserts. When casual gardeners and hikers ask "what was that large black butterfly? ", it is almost always the Pipevine Swallowtail. In fact, here in the low deserts, really only the Black Swallowtail is somewhat similar, but easily distinguished by noticeable yellow banding that is absent on the Pipevine Swallowtail. This is not to mention larval food sources - Pipevine Swallowtails exclusively use pipevines, such as Dutchman's Pipe, while Black Swallowtails larval choices are in the parsley family. 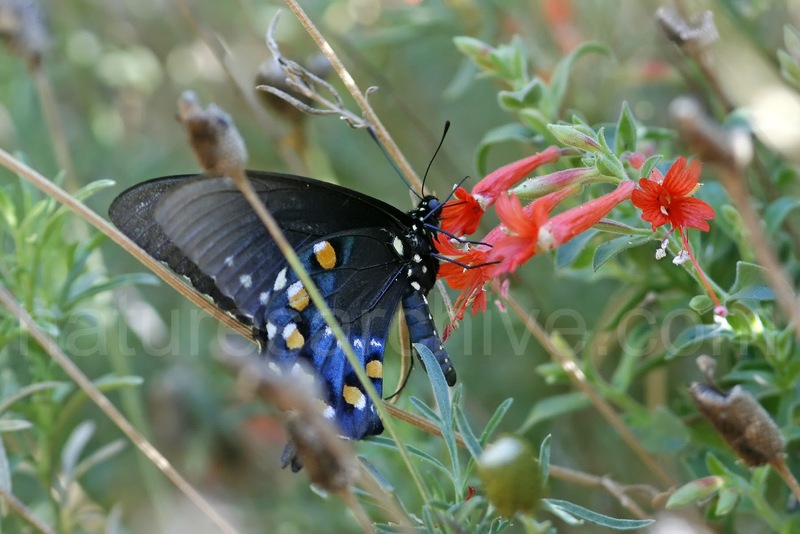 In fact, low desert gardeners who plant dill or parsley are likely to see the Black Swallowtail up close. Back to the Pipevine Swallowtail - their larval food choice of pipevine is likely an evolutionary protection against predators. The noxious pipevines result in toxic larvae and adults, which over time predators learn to avoid. This is very similar to how to the Queen butterfly is thought to have adapted to choosing milkweeds.